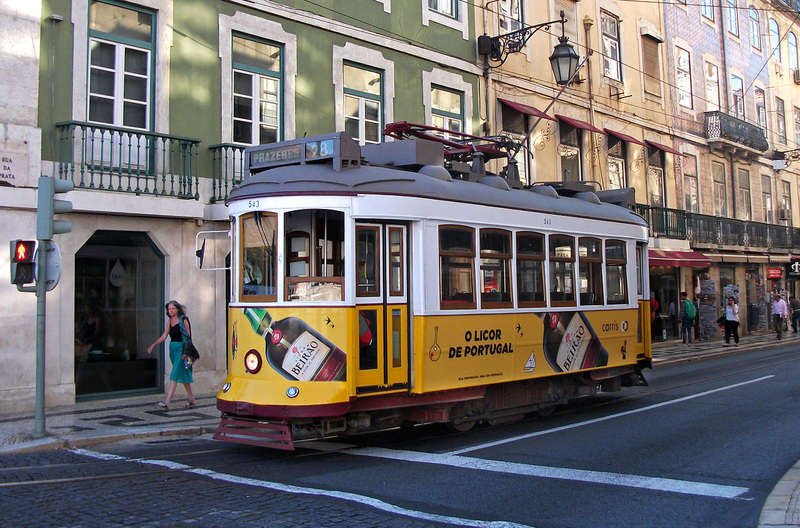 Trams in Lisbon-Portugal (26 September 2017). are the older design albeit now fully modernised internally to 21st century standards but retaining their unique 'old world' charm to work the other 4 operational route.The total route distance of this system is currently 76-km with an additional old route soon to be reopened to increase it still further. All Pictures taken using a basic Fuji-Finepix Compact Camera-AV130 holiday type camera! from that company 'Hills Tramcar Tour'. 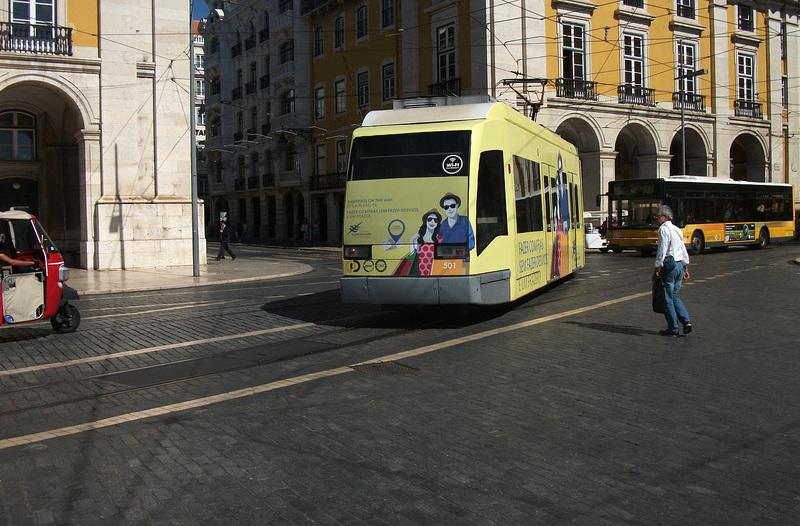 Tram 554 working a Route-25 service to Figueila passes Prata-do Comercio overtaking Tram-7 which was still trying to cram in all its passengers in. 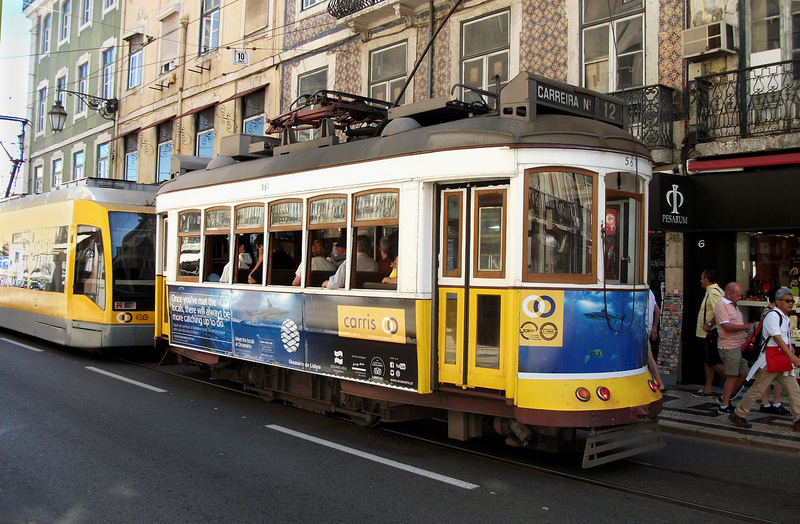 Carris owned tram (Carris being the local transport operator). 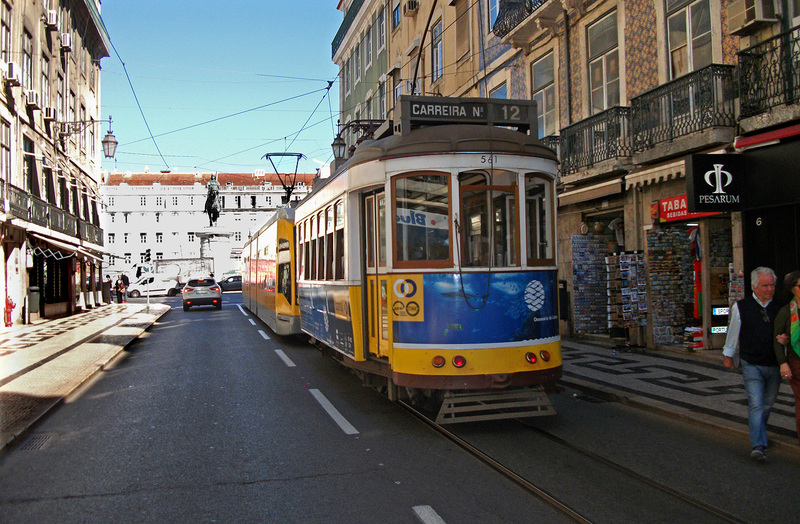 1930's series 4-wheeled Tram-561 working a Route-12 service to Carreira ambles along Rue-da Prata with a more modern ugly 500 series tram on Route-15 right in front of it. 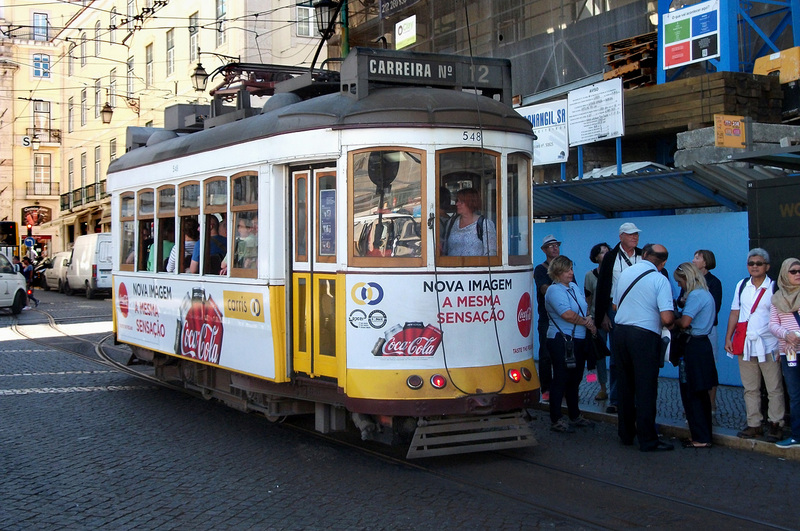 One of the more modern trams used here is Lisbon on Route E15 only (Thank goodness) Here is Tram-501 a dual-pairing.It has all the romance and class of a roadside skip!---Awful. 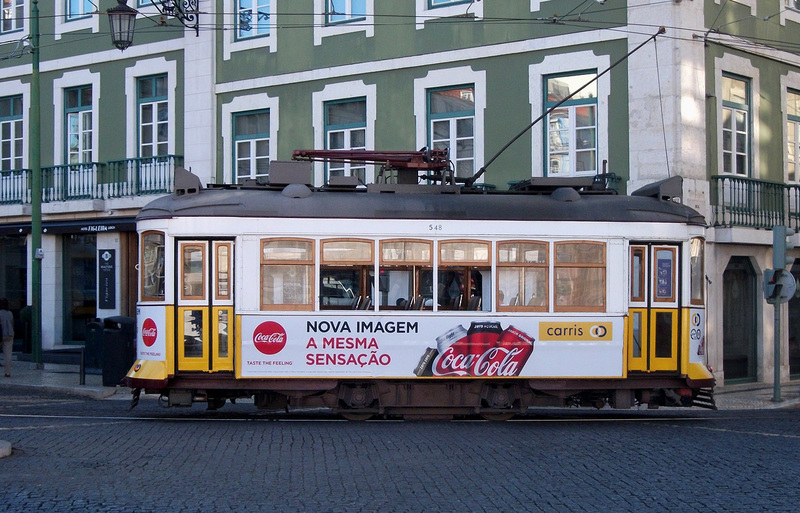 Viewed in Prata-do-Comercio in the main city centre of Lisbon. 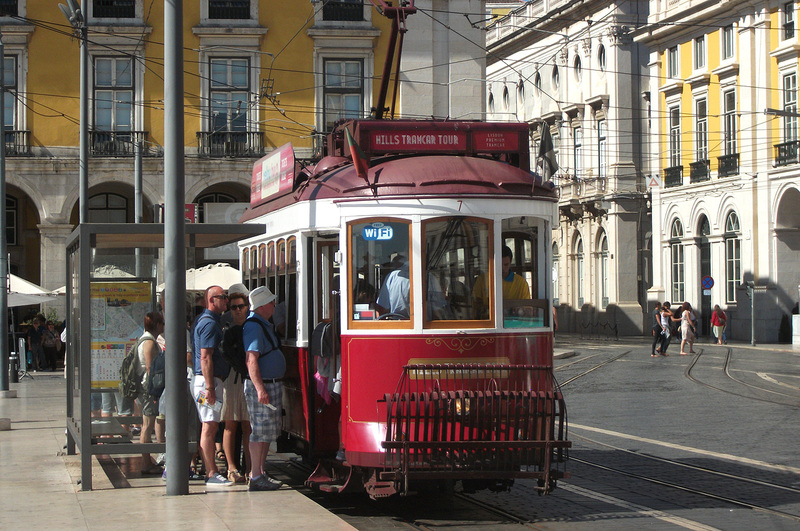 Tram-550 runs down Rue-da-Prata going apparantly to Reservado (Wherever that is?) No E Route code being shown. In fact it is just 'Reserved' probably on a charter working! 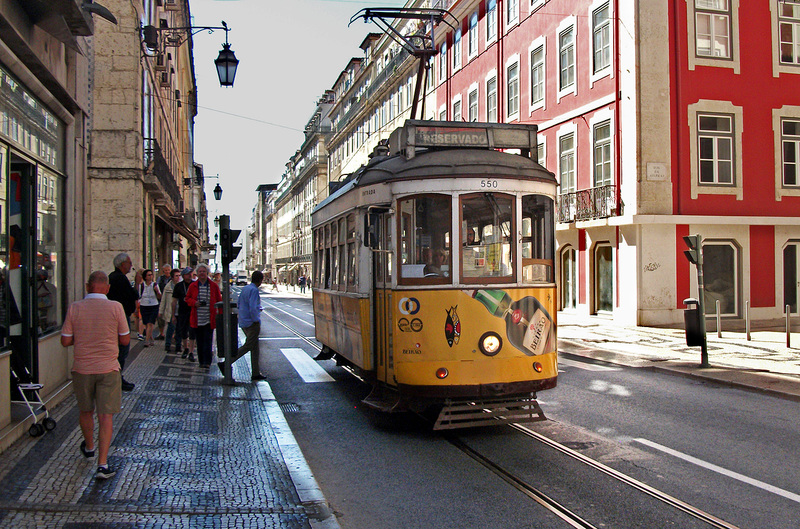 ​Note--this one is using the pantograph and not the trolley-pole! 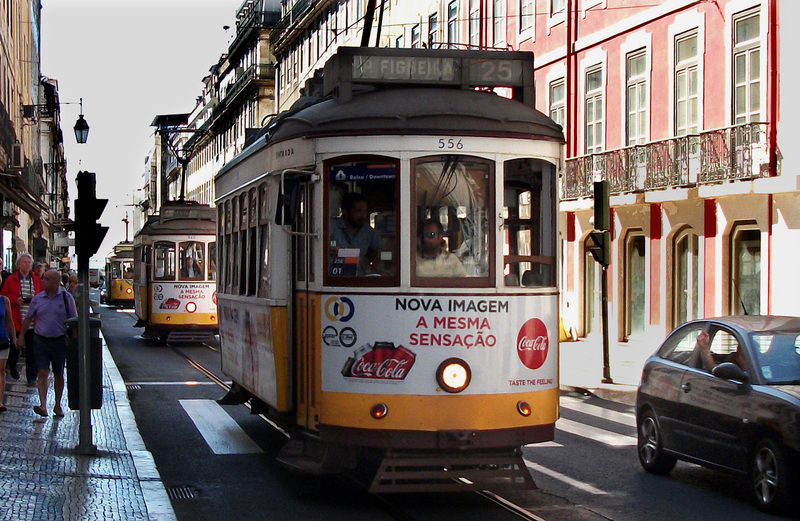 This is a Tram-Jam on the Rue-da-Plata in Lisbon! 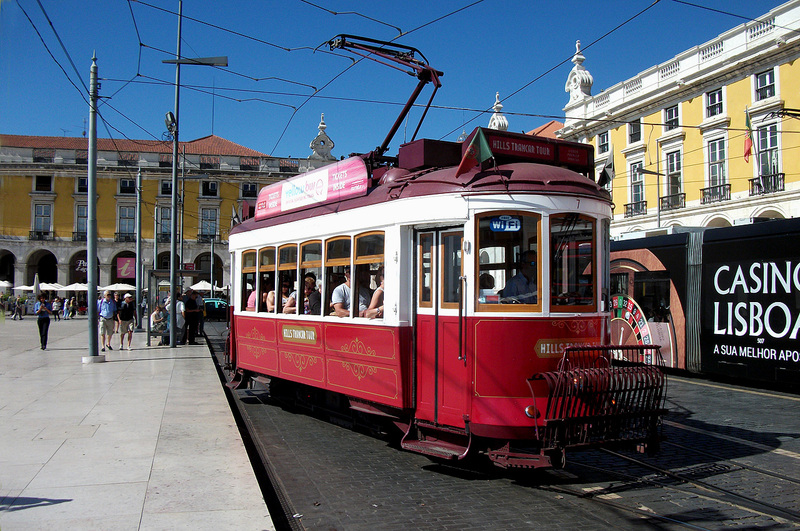 The lead tram being 556 going to Figueila on an E25 service. Tram-548 on an E12 service to Carreira halts in Placa-de-Figueire to allow some passengers to alight and hopefully squeeze a few more into the already fully loaded to standing passenger compartment. 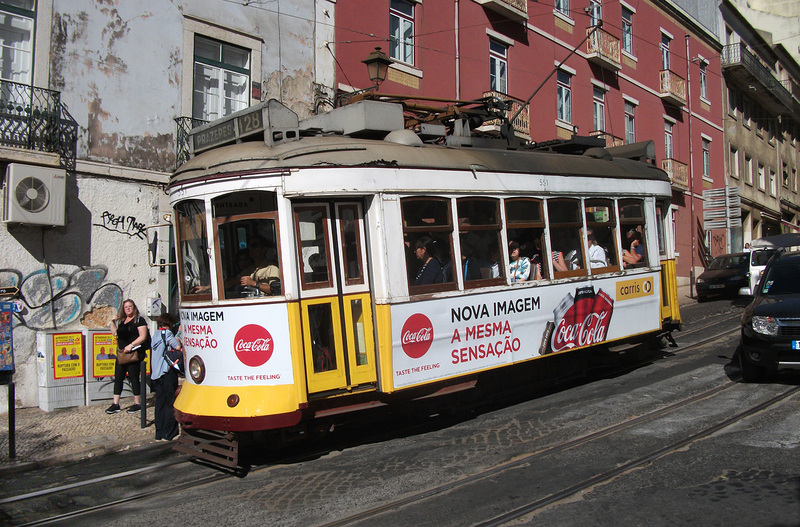 Tram-548 stops to take on a few more passengers onto an already full to standing Service-28 going to Prazeres.Viewed on a fairly steep hill somewhere in Lisbon old town from the rear-facing back seat of a Tuk-Tuk. 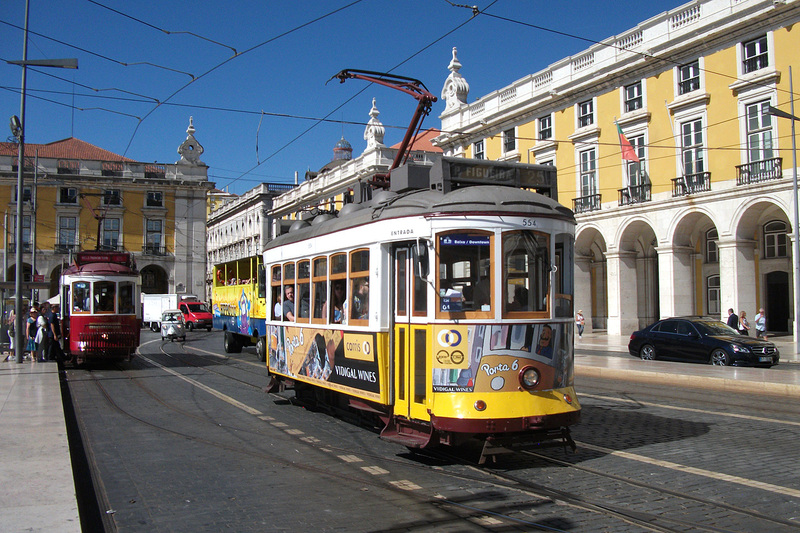 (A one hour tour of Lisbon costing 70 euro's). Tram-564 threads through the traffic which includes dozens of small vehicles called Tuk-Tuk's.I actually took this shot from a rear facing seat in one of those small cars.They are particularly ideal for the narrow streets in 'old' Lisbon particularly when avoiding the many trams that pass continuously! 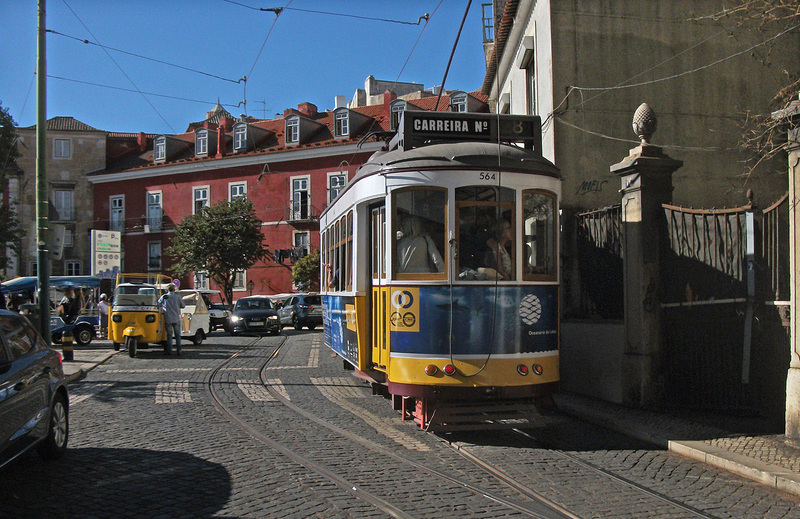 1930's Remodelado 4-wheeled Tram 548 rumbles through the narrow streets of Lisbon in the hilly old quarter above the main city on Route-28.Note these trams are equiped with both a pantograph and also an olde worlde type trolley pole. 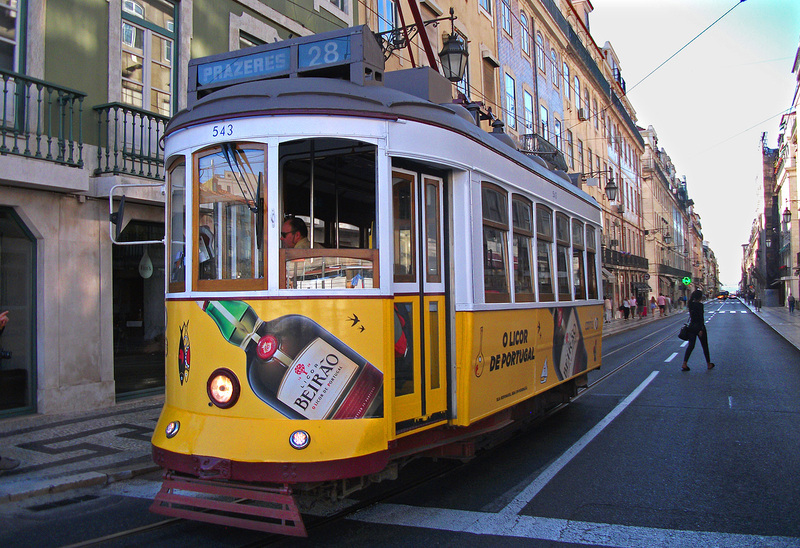 Another view of Tram-543 rattling down Rue-da-Plata working the famous 'Route-28' going to Campo Ourique (Prezares).These services are famous for massive overcrowding and is a favourite for the local pick-pocket gangs! Tram-543 rattles down Rue-da-Plata working the famous 'Route-28' going to Campo Ourique (Prezares).These services are famous for massive overcrowding and is a favourite for the local pick-pocket gangs!